A delicious Chocolate Cake made from 3 layers of rich chocolate sponge, sandwiched and covered in chocolate buttercream and finished with a generous layer of milk chocolate ganache. Made fresh to order from excellent quality chocolate, real butter and local fresh eggs. The cake is decorated with colourful chocolate pieces around the sides and filled with Maltesers and mini marshmallows, with cake pops in the top! Our cake pops are made by mixing our chocolate cake with its cake frosting (chocolate ganache) to form a yummy type of ‘cake truffle’. These balls of cake are then put onto lollipop sticks and dipped in chocolate and colourful sprinkles. 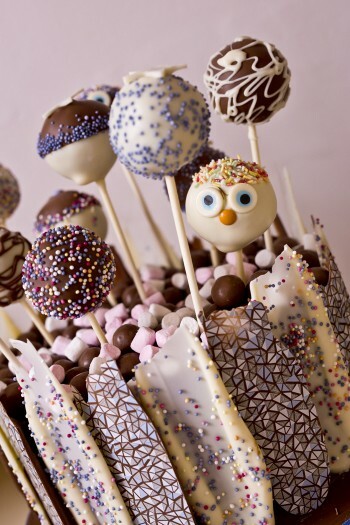 If you would like your cake pop cake to feature specific colours (pink, red, blue, gold, purple, green etc) in the decorations please let us know when you order. Milk Chocolate (min 33% cocoa solids) Dark Chocolate (min 53% cocoa solids) White Chocolate (min 29% cocoa solids): sugar, cocoa butter, whole milk powder, emulsifier: soya lecithin, vanillin. Chocolate cake: wheat flour, butter (milk), sugar, cocoa powder, eggs, raising agent (disodium disphosphate, sodium hydrogen carbonate), icing sugar, double cream (milk), salt. Milk chocolate (min 33% cocoa solids), buttermilk (milk), hydrogenated vegetable oil, vegetable oil, buttermilk powder (milk), modified maize starch, emulsifiers (sucrose esters of fatty acids, mono and diglycerides of fatty acids, soya lecithin), stabilisers (guar gum, locust bean gum), glucose syrup.